Igloo Products Corp., the nation’s largest cooler manufacturer, has expanded its collection of licensed Realtree camouflage coolers to include several new shapes and sizes. With this expansion we wanted to bring more products specifically designed to be used while in the field hunting. These new products have more insulation and specialized features that we think outdoorsmen will really appreciate. 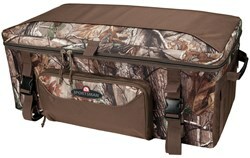 Igloo has added new products to its Realtree collection each year since its introduction in 2007. The new additions for 2013 and 2014 include five new silhouettes—HLC 12 Super Gripper, 24 Can Square Ultra, 36 Can Square Ultra, 36 Can SnapDown Ultra and 72-quart ATV Cooler—in the new Realtree Xtra pattern. According to Igloo soft-sides product manager Melissa Poole, this year Igloo has focused on adding more premium products to the collection. “Our Realtree collection has been extremely successful with a variety of consumers, but with this expansion we wanted to bring more products specifically designed to be used while in the field hunting. These new products have more insulation and specialized features that we think outdoorsmen will really appreciate,” said Poole. The 24 and 36 Can Square Ultras and the 36 Can SnapDown Ultra feature licensed Realtree camouflage exteriors with ultra-thick insulation that provide two-day ice retention. The ultra-thick antimicrobial liners are puncture and leak-resistant, while non-slip feet prevent sliding and help cooling airflow move underneath the cooler. The Ultra models also include comfort wrap handles and extra pockets for dry storage. The Realtree 72-quart ATV cooler has all of the features of the Ultras, plus extra exterior pockets for additional storage and quick release buckles that allow for attachment to ATV racks. Metal D-rings for additional bungee attachment are included. The Realtree HLC 12 Super Gripper comes with MaxCold insulation, a raised base with Cool Riser Technology, an ergonomic rubberized comfort grip handle, front slip pocket, and a leak-resistant antimicrobial liner. The removable hard plastic liner is easy to clean and has built in Chill Chambers, or channels compatible with Maxcold Ice Blocks. The Realtree 24 Can Square Ultra (MSRP $39.99), 36 Can Square Ultra (MSRP $49.99) and 36 Can SnapDown Ultra (MSRP $44.99) will be available at retail in fall of 2013. The HLC 12 Super Gripper (MSRP 29.99) and the 72-quart ATV Cooler (MSRP $69.99) will be available in early 2014. For further information about the Realtree collection or about any other Igloo product, contact Katie Davis at KDavis(at)igloocorp(dot)com or visit the company’s Web site at http://www.igloocoolers.com.